After 11 years in the Army reserves and the California Army National Guard, Cazadero resident Joe Meisch takes the Army engineers' motto seriously: Adapt. Improvise. Overcome. That's been his approach to turning his personal solution to a raging headache into a useful plastic gizmo that is apparently the only one of its type on the market. In the process, Meisch hasn't strayed far from his roots. And he hasn't forgotten his friends still serving in the military. Last fall, Meisch sent 40 of his unique temple massagers to his old unit, the 579th Engineer Battalion in Iraq. Another 40 went to Walter Reed Army Hospital, for use by amputees and post traumatic stress disorder victims. The response was incredibly positive; a Red Cross liaison has asked Meisch for 2,000 more for use at the Walter Reed and Fairfax Virginia Military medical facilities in Bethesda, Md. Meisch estimates it will cost about $8,000 to create that many, money he doesn't have. An injured finger has sidelined him as a carpenter—his "day" job—so he's contacting veteran and other organizations, hoping for assistance. "I'm going to donate as many to them as I can," Meisch vows. "For me, it's a priority." His efforts are centered around a 15-inch-long Y-shaped piece of flexible plastic that comes in sea foam green, violet, black, dark blue or sky blue. It's used to gently massage a person's temples, the location of the largest cranial nerve. The massage can be used along the jaw line, down from the temples and back again. 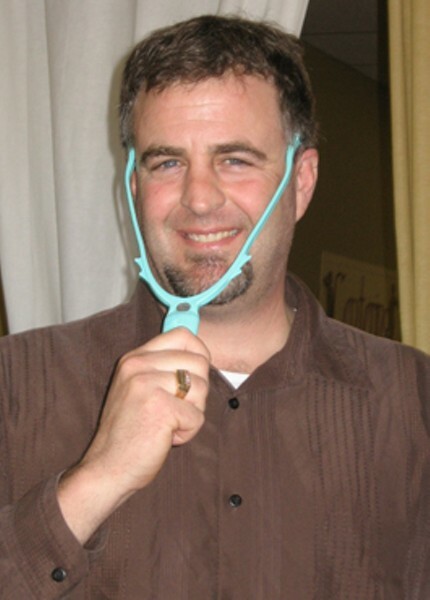 "It's kind of silly using it in public, because it makes your mouth hang open and your jaw hang down," Meisch laughs. Despite advice to manufacture his patented product in China, he's kept it a local operation. The manufacturing is done in the North Bay, he buys his supplies here and he even uses his mom's old 1963 Singer sewing machine to stitch up the storage bags that come with the massagers. Kirsten Iuppelatz is co-owner of Sebastopol's Pilates Collective, one of the local businesses selling the Meisch Temple Massager. "People try them out and really love them," Iuppelatz says. She adds, "We all tried it. It felt great to me in my jaw, which is where I hold my tension." The idea for his temple massager grew out of a road trip Meisch took with some friends prior to leaving the National Guard in 1998. Struggling to balance the demands of his National Guard duties, his push to finish college and the need to earn a living, Meisch was tense, irritable and had a headache. Holding his sunglasses by the bridge, he idly used the tips to massage his temples. The effect was immediate. There was a calming sensation in his jaw line and a warm feeling in his temple area. His head felt better and his focus returned. "My headache disappeared," he says. "That's when the proverbial light bulb went off, so to speak." After he got home, Meisch tried to buy a temple massager and found there were none on the market. He spent the next few years trying to create one—burning plastic in his oven, mangling clothes hangers, playing with chemicals and breaking wooden models. Eventually, he decided needed proper materials and a professional mold. It's been an educational experience. "I had to learn an enormous amount about manufacturing, marketing, financing," Meisch says. "I had to teach myself plastics. I had to teach myself mold-making." The first company he approached urged him to have the mold and the units manufactured in China. Determined that he everything should be made in the United States, Meisch ended up working with Designit Prototype and R&D Products Inc., both in Rohnert Park, for creating the mold and manufacturing the units. The plastic used is 100 percent recyclable, and Meisch buys the fabric for the storage bags from Carolyn's Canvas in Valley Ford. He sells through local stores and on the Internet. "In a small way, I'm stimulating my own local economy," he laughs. There've been a few stumbling blocks. The massager includes an aromatherapy pad that lets soothing scents surround a user. But the first thousand or so models were made with a different type of plastic. The oil ate through them and they had to be tossed. Undeterred, Meisch continues on, determined to get his product to a wider audience. He's especially determined to come up with enough to donate to the military hospitals. But he shakes his head in wonder at how far he's already come. "I'm still to this day blown away that I thought of this and that nobody else has one out there." To donate, go to www.templemassager.com.